Bob Dylan’s greatest television appearance (so far) has to be May 22, 1984 on Late Night with David Letterman. Dylan, promoting Infidels, refused to be interviewed, so he performed three songs. What makes this so remarkable is that he performed with the Latino new wave band, The Plugz. For one brief moment we got to see what would have happened had Dylan gone new wave. It would have been awesome. As I mentioned last week, Dylan spent part of his off year 1982 hanging out with his son, who had more adventurous taste in music than did the old man. Dylan showed up at new wave, punk, and post-punk shows and began to become plugged in to that scene. Somewhat unexpectedly, he began jamming regularly with members of The Plugz in Los Angeles. The Plugz were, with The Zeros, among the earliest Latino punk bands (founded in 1977). They may be best remembered by non-Angelenos now for their version of “Secret Agent Man” on the soundtrack for Repo Man. “Don’t Start Me Talkin’”. This is a Sonny Boy Williamson song that, apparently, they had not rehearsed. 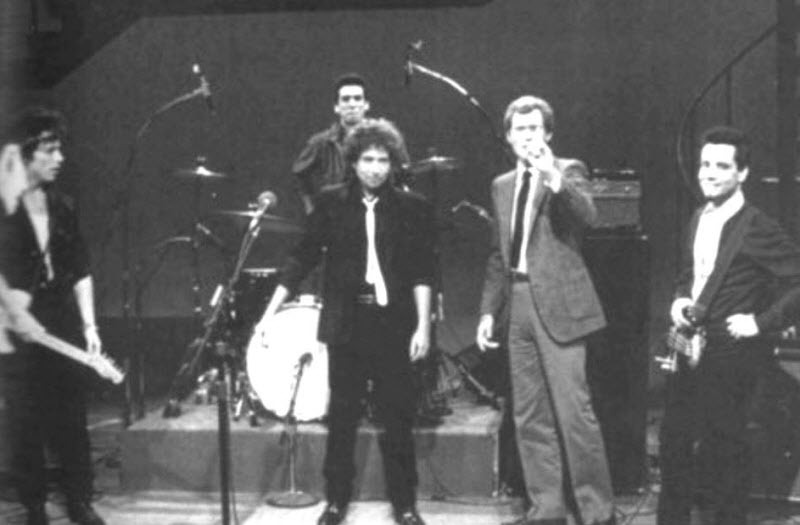 Dylan enjoyed testing his band by announcing new songs on the fly, and here he did it on live-to-tape national television. Letterman introduces Dylan, waves a copy of Infidels in front of the camera, and he launches into a song that has nothing to do with that album. Okay. He’s looking good (compare to his SNL performance from five years earlier, where he introduced the world to normcore stylings). This first song is mostly carried by guitarist J.J. Holiday. This has to be Dylan’ idea of a joke – refusing an interview but playing “Don’t Start Me Talkin’” by way of explanation. “License to Kill”. This is just so vastly superior to the Infidels version of this song, especially the harmonica outro. Dylan changes the phrasing considerably, and Holiday’s jangling guitar works a million times better than the album version. Dylan may never have done a more interesting version of this song. “Jokerman”. This is almost the greatest thing ever. So very very close. As I’ve said, I like “Jokerman” as a song. This is the best version of this song. It should have been sung this way, and it should have been played this way. Dylan all of a sudden sounded at home in the early-1980s. Relevant. In touch. The grand old man of post-punk! Look at those pants! That thin tie! He fit right in! He throws his arms in the air! He’s engaged! But, of course, it sort of falls apart when he tries to find his harmonica. He seems to cycle through about eight of them. From 3:11 to 3:57 the band has to just jam while Bob wanders around, frustrated. The wheels come off and it never quite gels again. I’ve watched this at least a dozen times this week – I just love it. That was it though. His band for the 1984 summer tour of Europe had guitarist Mick Jones, and it kind of sucked. I’m not sure The Plugz was the type of band to play huge venues with Dylan and Carlos Santana all summer, but I’d have rather heard them try. I did not see this when it aired. I think I would have remembered it. I was fifteen at the time, and Late Night was too late night for me and we didn’t have a VCR. I think that this would have confirmed my early Dylan love, had I seen it. In the end, this is a bizarre Dylan oddity. Versions of these songs unlike any he’d do again. A brief glimpse of a Dylan that might have been. Love those knee-bends. Love the other players holding their axes up with oh-so-coolness. Ha! Where’s the lost album by Dylan and the Attractions? THIS band of rocking rug rats really was the greatest. It may have been an amazing and different world in the 80’s musically if Dylan had toured with these guys as this raw young band of musicians developed. Maybe even now. I did a search and found this guitarist JJ Holiday today. He is an interesting character for sure, great guitar player. It seems, among other things, that he plays his guitar behind Blues Brothers and also Chuck E. Weiss in Los Angeles where they recently appeared on The Jimmy Kimmel TV show when Johnny Depp was a guest. Depp went in stage with them too. Cool! Some connection there too I think.